UNDER CONSTRUCTION. Brand new construction from one of the bay area's most popular builders. Lucaya Lake Club is a rapidly growing community in South Hillsborough County. It is an all natural gas community and features resort-style amenities including a club house, fitness center, splash park, playground, and swimming pool. The most beautiful feature of this community is its 78-acre lake; accessible to all residents for canoeing, kayaking, paddle boarding. 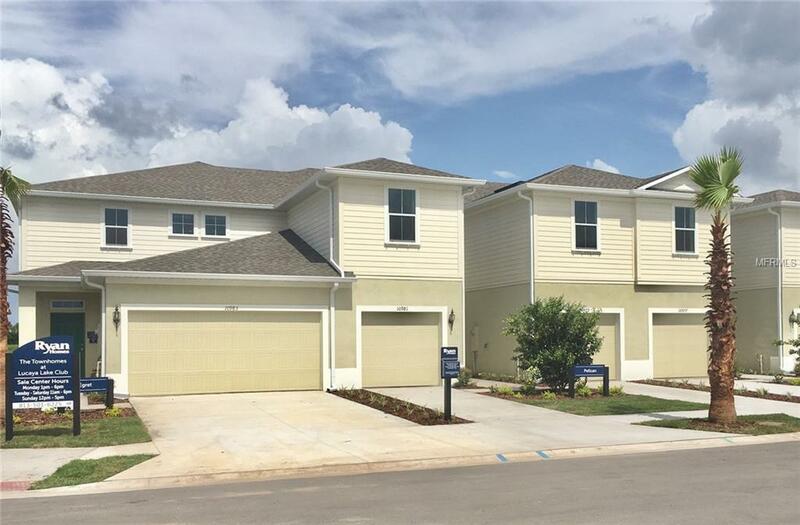 This townhome features 3 bedrooms, 2 1/2 bathrooms, a covered lanai, and a 1 car garage. Gorgeous pond view with no rear neighbors! You will find beautiful upgrades throughout this home including 42" maple cabinets, royal cream granite. Glass shower doors, stainless steel appliances, kitchen pendant lighting, two-tone paint, kitchen tile backsplash, updated stair hardware and rails. There are dual sinks in the owner's bathroom, plus so much more! Buyer will receive closing cost assistance with use of NVR Mortgage.Disclaimer: Prices, financing, promotion, and offers subject to change without notice. Must use NVR Mortgage to receive promotion. Offer valid on new sales only. Cannot be combined with any other offer. See a Sales & Marketing Rep for details. All uploaded photos are stock photos of this floor plan. Home will look similar to photos.